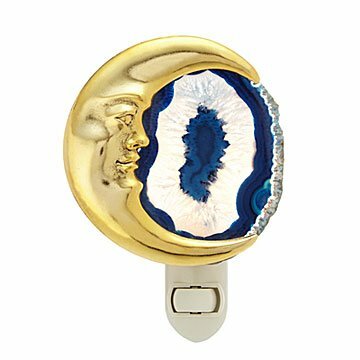 To make this enchanting nightlight, Michale Dancer pairs a steel moon with a slice of midnight-blue agate. A nightlight like this one comes around once in a blue moon. Michale Dancer pairs a hand-tooled steel moon with a slice of midnight-blue agate, a radiant material believed by the ancient Babylonians, Egyptians, and Greeks to produce delightful dreams. Made in Corte Madera, California. Handle with care. Wipe clean with a dry cloth. I love a deep blue color, and a crescent moon. When I saw the nightlight that combined the 2, I was thrilled. When it arrived, the "blue" agate was mostly white, and not satisfactory, esp. considering the cost. I was willing to exchange, but was told "there's not anyone who can try to select a better one for you", so I returned it. Was very disappointed. The one portrayed in the picture is lovely. we purchased this as a Christmas gift for my mother-in-law, she loves it. The nightlight was very unique and my daughter was extremely happy with it. Not like the picture at all. What I received did not look like the picture. The blue agate was too thick so no light actually passed through. It's just a dark blue blob in the middle. All the white light just spills out around the side. Not an attractive night light. Bought this for a friend. I think she will be thrilled! !